2015 Panini Oregon Ducks Collegiate features a detailed look at the University of Oregon's athletics program. In addition to a variety of base cards and parallels, collectors will find one autograph or memorabilia card per box. Based in Eugene, the Ducks are best known for their football team in recent years and also for their green and yellow color scheme. Football is heavily covered in the 50-card base set, with names such as Kiko Alonso, Jonathan Stewart, LeGarrette Blount, LaMichael James and Haloti Ngata. Heisman winner Marcus Mariota is joined by Jake Fisher and others among the 2015 NFL rookie class. NBA player Luke Ridnour is part of the basketball options. Covering many of the football and basketball subjects, Signatures and Memorabilia cards offer a pair of hit options. The primary insert, Honors celebrates the award winners of the bunch, including those to win the Heisman Trophy and Doak Walker Award (top college running back). More cardboard options exist in the form of numbered parallels that extend to the base and inserts sets. This includes Silver, Gold and Black. 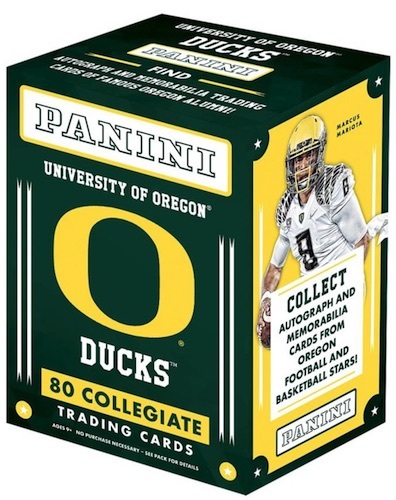 The University of Oregon joins many other top schools in the Panini Collegiate line. 49 cards. Player position noted below.